Besides a few little nitpicks and other issues that have been reported via our forum and Discord server, I personally think that the release of TrotMania Euphorius went pretty good. But of course, these nitpicks have to be addressed eventually. Thankfully, we tend to be good with that: if you are new to this particular pack, you should be aware that we sometimes release patches to address issues with the songs themselves, such as timing/sync and the routines themselves. We use a milestone-based system; each update typically contains such patches, and may also contain additional songs and other content. On Euphorius, we will be referring to these milestones as “payloads”. Each one will be cumulative; they will all contain the contents of all previous patch packages, so if you miss an update, you can catch up. In rare cases, we may update the full package download to include these patches as well. 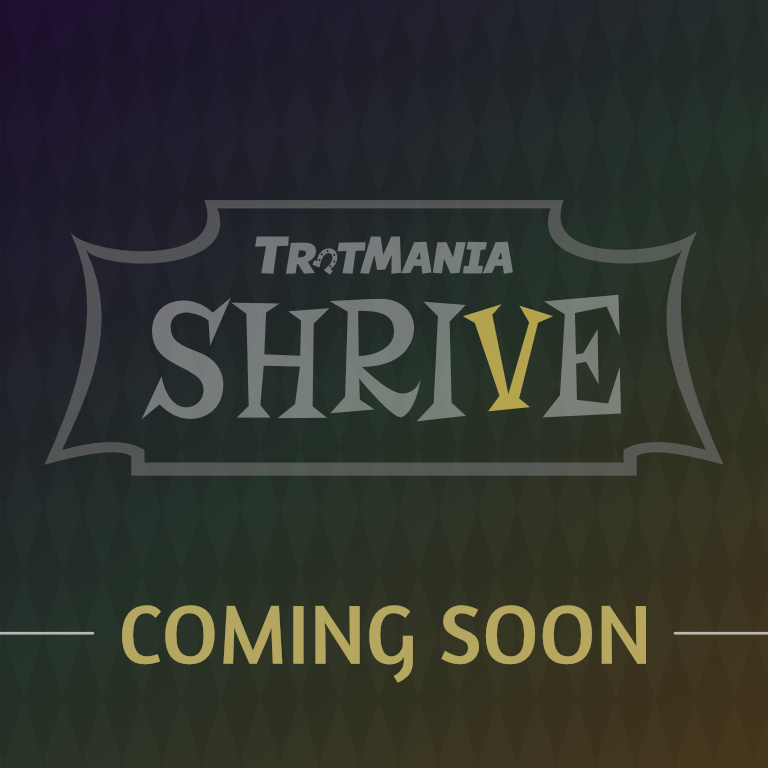 The TrotMania themes also tend to receive updates over time, but these are often bug fixes and minor adjustments. Some are timed to release alongside song updates, but most of them are out-of-band (i.e. not on any specific schedule. If the bugs are urgently in need of fixing, they’ll be urgently patched). We suggest you keep checking back on the TrotMania site from time to time for updates on these, well, updates. There just so happens to be one of these theme updates right now, actually (which is the real reason for this post, to be honest). Theme version 1.0.3 is now on the downloads page, which fixes a few minor bugs and issues, and also adds a refreshed results screen. We suggest that you check it out if you had previously downloaded Euphorius. 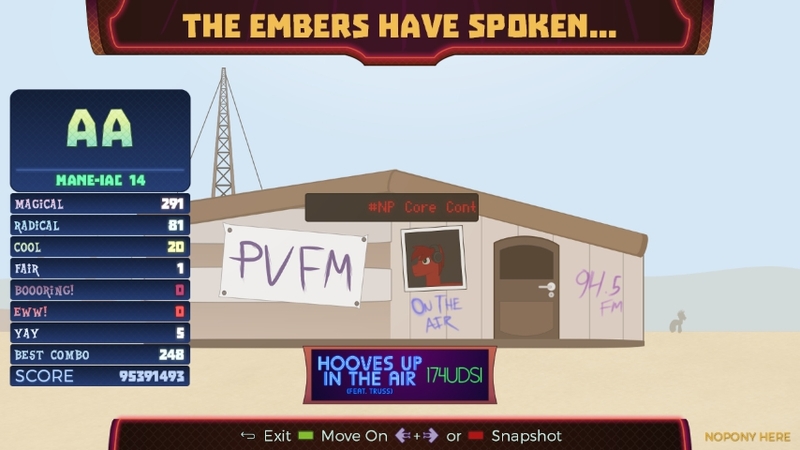 As you waited patiently for a 15-minute bus ride back to Las Pegasus after three straight nights of partying alternated with being a stagehand, you couldn’t help but wonder what this ‘Gathering of Embers’ event being advertised at the truck stop was all about. On your way out, however, you wound up bumping into a mysterious pegasus that called herself “Blast Furnace”. She recognized you from over the weekend, and was all but interested in explaining what this Gathering thing was about. Her enthusiasm over this event you’ve never heard of was no surprise, given that her extended family has direct involvement in it. As if your career as a lighting technician hasn’t dragged you into interesting subcultures already. All the stuff she was talking about was intriguing; camping out in a temporary city in the middle of a desert near Reino that disappears entirely when it’s all done, weird experimental art, campsites hosting DJs you’ve never heard of before, everyone dressing up like they’re an extra in that Project Horizons movie (everypony loved it, although the critics thought it was a bit too long), and a gigantic bonfire involving some form of ‘wicker mare’ that represented a mythical being of evil that has long been banished to a different realm. She even offered to provide you with orientation to deal with the “finer points” of the event, although the mere fact that there are finer points alone are a tad odd. This is it, everypony! TrotMania Euphorius is finally here. There was a time back when I didn’t even think that TrotMania would be more than just a one-and-done fan project. But, clearly, that wasn’t the case, given that we’ve now done this four times in a row! If you’ve been following us since the beginning, you should know exactly what to expect. 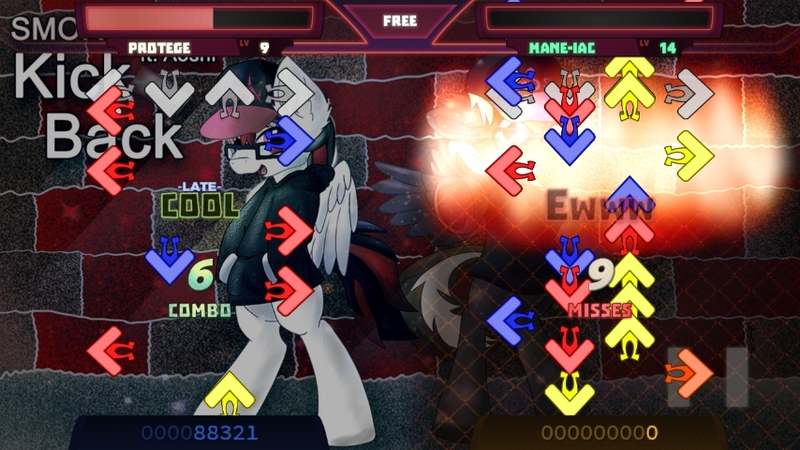 We have a brand new StepMania 5 theme, over 60 new songs – including selections from the Ponies at Dawn and Pinkamena Party albums (and still more to come), a slew of new challenges, and a number of things that we have never done before. One of these new challenges (also a thing that we’ve never done before) is, appropriately, experimental art. 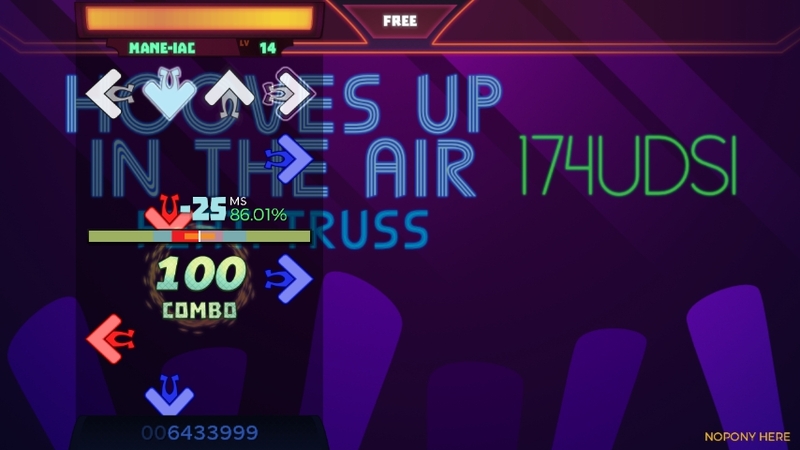 Although if you’ve been following the general StepMania/ITG community, you can probably figure out what it is by this description alone. Rather than keep you waiting with five more paragraphs full of exposition and explanation, let’s just cut to the chase and get on with the show, shall we! Also, as I mentioned before, we’re still having an OC art contest inspired by Euphorius; your art could be featured within the TMIV theme on future updates and patches. The logic behind extending it was one of sensibility, now that you have your hooves on the final product for influence to see how its done. Several of the entries are already in it, so check it out! 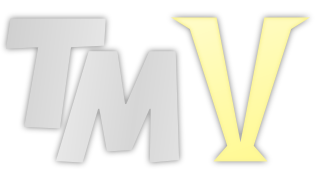 An update has been released to the theme that fixes a few minor oversights. It is available on the downloads page.